Get the Grace and Aise bundle for $13.99 here! Aise (“ease” in French) elevates the classic tank top from sporty to chic. The tank is worked in the round from the top down, so there’s minimal finishing to fuss with. The front panel features a delicate Japanese lace pattern and cable-like traveling twisted stitches. The result is a polished look with a carefree attitude. Paired with your longest skirt or your shortest shorts, Aise is sure to see you through all your summer engagements with ease. 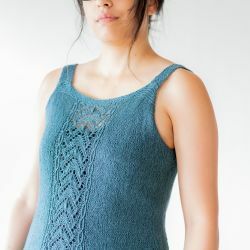 If you like the look of this design but want a bit more coverage, be sure to check out Aise’s sister pattern, Grâce. Grâce, a raglan tee, and Aise, a tank, both feature a lovely and delicate Japanese lace motif. I named the patterns so because we are often so hard on ourselves, whether it’s critiquing our intelligence, our bodies, our voices, etc., there is often something to beat ourselves up over. Learning to grant myself grace and ease has been a years-long journey. I’m still learning it. But I’ve found that it just feels so much better when I talk to myself the way I would someone that I care very much about. Would I talk to my best friend in a cruel and condescending manner? No! So why would I do the same to myself? 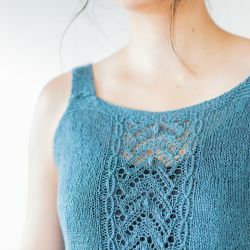 It is difficult to find patterns, garment designs especially, that can accommodate the diversity of shapes and sizes that are present in our fibre community. 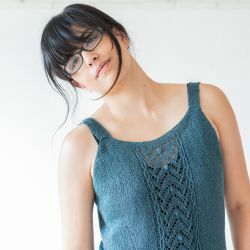 That is why I believe Tineke’s work at Kniterator is so important. Through her science and math know-how, with my artistic eye for design, we hope to be better able to provide patterns that more people can enjoy, as we are all worthy of some grace and ease in our lives. Pattern information is based on the materials used in the sample. As this is a pattern generator based on gauge and measurements, your yardage and needle sizes will vary. Linen is a plant-based fiber - it features lots of drape, and is light and airy. It is not very elastic though. For the sample size of 36 in./91 cm, approx. 3 skeins of Reed was used. US 3 (3.25 mm) 24 in./60 cm circular needle.